Dougie with Animal Rescue Live presenter Steve Jones, and owners Samantha and Hannah Adams. Two British TV star ponies have turned their backs on the celebrity lifestyle and are enjoying quiet lives and new jobs in the countryside. 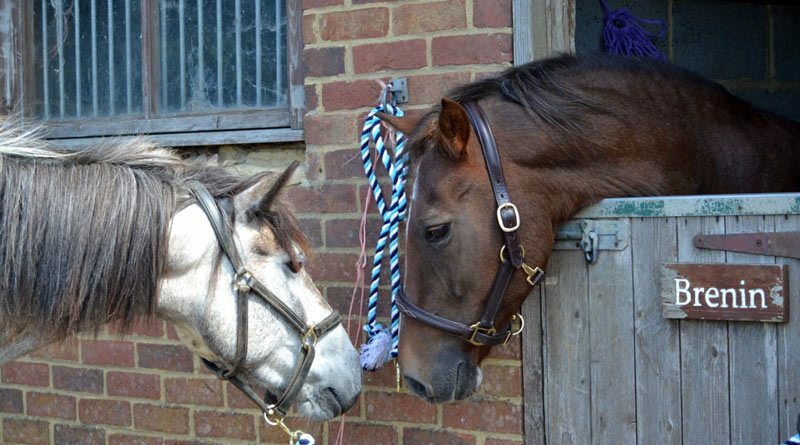 Dougie and Puffin, the irresistibly cute Blue Cross pony stars of Channel 4’s Animal Rescue Live this summer, are now flourishing in their new homes. Dougie, who was a favourite with presenter Steve Jones, is now turning his hoof to show jumping with the Adams family in Staffordshire. And little Puffin is in pony paradise with the Mansell family in Buckinghamshire. Dougie before his rescue and rehabilitation. The Adams family gave Dougie a home after meeting him at Blue Cross in Rolleston five years ago. His future had looked bleak initially because of the severe starvation he had suffered as a foal, which had left him with neurological and coordination problems. But, specialist staff at the charity spent months of dedicated care to get him back on his hooves and ready to find a loving family. Already caring for another Blue Cross pony, Samantha Adams and her daughter Hannah felt that they could give Dougie the love, care and companionship that he’d been lacking. Dougie was chosen to feature on Animal Rescue Live as an example of what an abandoned pony with little hope can turn into thanks to the work of dedicated charity staff. Channel 4 spent an entire day with the family and Dougie behaved immaculately throughout, much to Samantha and Hannah’s pride. Little Puffin also featured on the show during the summer and is now happily ensconced in her new home with pony-mad Emily Mansell and her family in Buckinghamshire. The pretty seven-year-old mare took a long time to learn to trust humans again, having suffered some of the most shockingly cruel treatment the Blue Cross has ever known. She wowed the Animal Rescue team when she was filmed for the show and Emily, who had first met Puffin at Blue Cross Burford the previous week, was even more smitten when she saw the cute pony on the big screen. Emily’s mother Jane Mansell said: “Puffin travelled well and quickly settled in with our retired New Forest pony Maisy. Because we are lucky enough to keep Puffin at home she continuously sees us and her confidence is growing every day. Puffin on arrival at Blue Cross in Burford. National pet charity, Blue Cross has two specialist horse rehoming centres at Burford and Rolleston and 11 Centres nationwide. Puffin meeting Maisy for the first time. ← Can animals tell an earthquake is coming?